I've been playing with Mixxx for a while now. 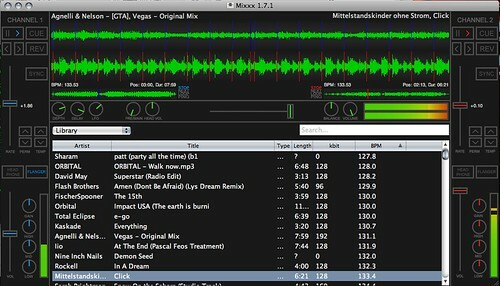 Not quite as fully-featured as some of the cheapware DJ Mix stuff that I was only able to find for Windows. Mixxx shows a lot of promise. It's open-source and cross platform. Get your dance party on! I like the fact that I can jack an external USB sound device in and it gets recognized, so you can cue up your next track on your headphones while the main track is on the house speakers. Yes. I have Rockell and Nine Inch Nails showing on that screen at the same time. LOL.